As far as I know, the snake was awake and alert when I sat down just inches from his coiled body. I was hiking the Wasatch on a muggy August evening with Cooper, my neighbor’s grandson and eleven-year-old snake prodigy, when I sat on a flat, ottoman-sized rock to dangle my feet over the edge of a 60-foot ravine. Cooper stood behind me admiring the surrounding cliffs. Then he spoke. 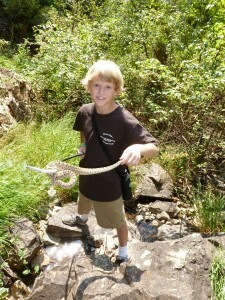 11-year-old Cooper handling a rattlesnake. “Uh, Dave?” Cooper said calmly. He was as matter-of-fact as if he was commenting on the weather. Cooper is a great kid with a slightly mischievous side, but he’s as honest as a judge. The irony is that we were looking for snakes. It’s what we do. “I did not!” I replied indignantly. Or did I? Sure enough. Looking over my left shoulder I saw the broad head of a Great Basin rattler gliding slowly away to my left, parallel to the edge of the cliff. He was ash gray with charcoal saddles, enabling him to blend easily into the shadows of the surrounding rocks and vegetation. My snake stick was just out of reach and in front of me was a long, lethal drop into a deep crevasse. Not an ideal situation for a rattlesnake encounter. I let the snake glide far enough that I could see the segmented structure of his rattle. With his head a safe distance away, I picked him up by his tail with my left hand and asked Cooper if he could take the snake for a moment. Stepping up like the trooper that he is, Cooper confidently took the three-foot reptile from me, holding it gently in front of him with the forward part of its serpentine body resting on the ground and facing away. The snake was more confused than annoyed, and though its bifurcated tongue rapidly tasted the air, it didn’t thrash or rattle at all. Sliding back from the ledge, I stood up on level ground and reached for my snake stick. We took his picture, then watched him take refuge in the safe, shady haven beneath his boulder. Only then did he rattle. It was a dry, hollow sound like a maraca being shaken very quickly, but muffled within the alcove of his secluded fortress. We wished him well and proceeded down the trail. I tell this story to make a point. My years of snake experience have taught me that snakes have very little in common with those satanic creatures from the Bible, cultural myth, urban legend, and that most disreputable source of all, the Hollywood movie. Snakes were first given a bum rap in that whole Garden of Eden fiasco and they deserve better. Far from being emissaries of evil, snakes are shy and reclusive creatures that can’t possibly defend themselves against predators many times their size, especially humans, and all they really want is be left alone. They live, eat, reproduce and do their best to survive in a world that holds them in contempt, and yet we could not live without them. Fear of snakes is called ophidiophobia, and for some it can be an almost debilitating condition. While there may be a self-preservation response buried deep within our brains that protected our primitive ancestors from the threat of venomous snakes, most ophidiophobes are more likely victims of the prejudices imposed on them by others. Children typically gravitate toward snakes unless they have been taught to be afraid, and children who learn the fascinating truth about snakes early on don’t grow up to be phobic adults. 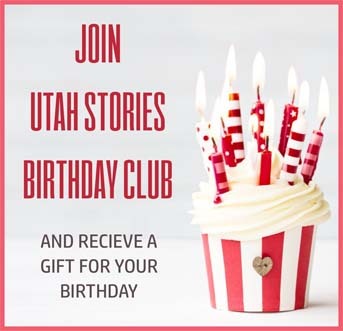 Utah has 31 snake species that inhabit the state from border to border and mountain top to desert valley, but only seven rattlesnake species are venomous. The other 24 species are harmless, reclusive, nocturnal, and seldom-seen serpents that pose no threat to anyone. There are no copperheads, cottonmouths or coral snakes in Utah, and contrary to popular opinion, no diamondback rattlers either. This is good news for anyone that doesn’t like snakes. From spring until fall, you are likely to meet one of these amazing serpents almost anywhere you go in the Beehive State. Because of their value in the environment, Utah wildlife laws make it illegal to harm or kill snakes or any of the state’s native herpetofauna, which includes all of our reptile and amphibian species. In spite of this prohibition, ignorant people sometimes express their contempt by killing every snake they can. As a snake removal specialist, I have had people call me to pick up the pieces of the snake they just killed. I asked one woman why she didn’t call me before she killed the snake. She swore at me and hung up the phone. This attitude is unfortunate because of the innate benefit snakes provide to humanity as a natural source of vermin and disease control. Snakes are nature’s best mouse traps. Raptors, owls, and other animals eat rodents too, but mostly the adult animals. Snakes crawl into rodent burrows and eat the young, eliminating generations of potential rodents that carry diseases and eat our food crops. If you have never had rabies, Hantavirus, Lyme disease or the bubonic plague, you should probably thank a snake. 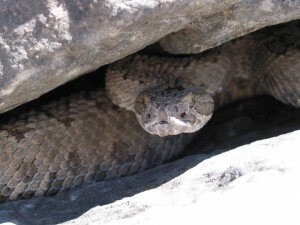 Great Basin rattlesnakes are a fact of life in Utah, as ancient as the mountains themselves. They are still prevalent today along the Wasatch Front in spite of human encroachment into their domain, and they’re not going away. The secret is to learn how to coexist. These shy and reclusive reptiles don’t want anything to do with us, and they don’t attack us as some people mistakenly believe. Media reports are often sensationalized to the point of hyperbole. There have only been five deaths from native snakebite in Utah since the Mormon pioneers arrived in 1847. Of those, only one is considered a legitimate bite resulting from an accidental encounter with a rattlesnake. The rest are classified as illegitimate bites because they were instigated by humans trying to provoke or kill a rattlesnake. In the U.S., there are only about five snakebite deaths per year, yet this statistic is more than offset by the thousands of people who will benefit from the many enzymatic derivations from snake venoms being developed to treat neurological conditions like Alzheimer’s and Parkinson’s diseases, various cancers, diabetes, and the prevention and treatment of stroke. Whatever you think of them, snakes really are amazing creatures, and they’re more afraid of us than we are of them. The next time you meet one, wish him well and let him go on his way. If there is a harmless snake in your yard, he is doing you a huge favor by eating rodents and other pests. If you find a rattlesnake in your yard, have it relocated by a professional. As for my rattlesnake friend, Cooper and I visit him occasionally. He is almost always at home, comfortable under his rock, bothering no one. We call him Fred. 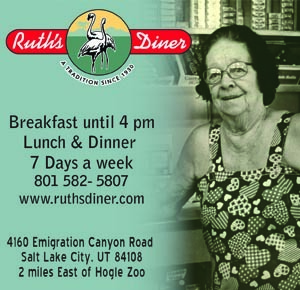 • Most of Utah’s 31 snake species are harmless. Only rattlesnakes are venomous. • Never crawl under a fence in tall grass or reach into a hole or bush. • When climbing, never place your hands where you can’t see them. • Making noise will not scare snakes away. Snakes are deaf and cannot hear airborne sounds. They do feel vibrations in the ground, so if you want to lessen your chance of seeing a snake, walk with heavy steps. • Snakes will often bask on trails or roads in the morning and evening hours. They may be asleep. If you can’t go around one, stomping your foot should wake him and cause him to crawl away. Some people have rolled pebbles at a snake until it moved off the trail. • There is rarely such a thing as an unavoidable encounter with a snake. All you have to do is take a step or two in reverse and you’ll be out of striking range. Snakes do not want to bite us, but like any animal, they will defend themselves if they feel threatened. • Teach your dog to avoid snakes. 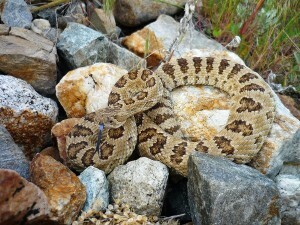 A dog that is bitten by a rattlesnake can incur a hefty vet bill. • Utah law prohibits the killing of native snakes, and killing certain species could result in a fine. • Remember, the only good snake is a live snake. Live and let live! Learn anything about snakes? Share this article with your friends!